Today in Ontario, families are forced to choose between heating and eating. This is unacceptable. An Ontario PC government will bring rates under control – and we’ll start from the top. The Hydro One CEO makes more than $6 million, while Ontario families can’t make ends meet. Under a PC government, we will clean up the hydro mess left by the Liberals. 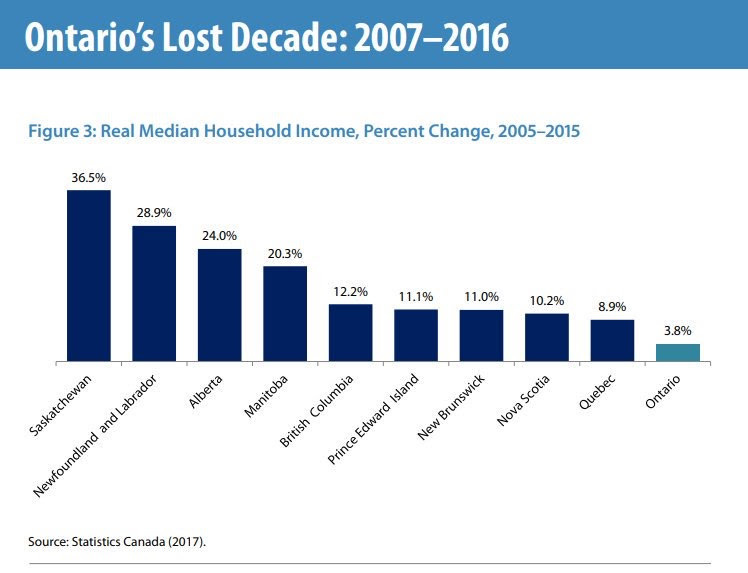 Since 2005, Ontario’s median income grew by 3.8 per cent - the slowest of any province or territory in Canada. Simply put, Ontarians feel like they’re running in place and not getting ahead, and that’s because they are. It’s time to put more money in the pockets of hard-working Ontarians. Doug Ford and the Ontario PC Party will create a minimum wage tax credit so that those on minimum wage pay no income tax. The Ontario PCs will commission an independent outside audit of Liberals’ reckless spending. We will follow the money, and we will release every single word and every single number to the people of Ontario. We will also crack down on the spending of taxpayer dollars for partisan campaigning and restore the Auditor General’s power to monitor government advertising. Under Kathleen Wynne and the Liberals, Ontario has lost more than 300,000 manufacturing jobs. Skyrocketing hydro rates, carbon taxes, and red tape are driving entrepreneurs away. Under a PC government, Ontario will be open for business, starting with lowering corporate taxes from 11.5 per cent to 10.5 per cent. The number of seniors in Ontario will double by 2041 from 2.3 million to 4.6 million people. Despite this increased pressure on our healthcare system, Kathleen Wynne and the Liberals cut $4 billion in patient services and froze hospital budgets for nine straight years. An Ontario PC Government will end hallway medicine by building 15,000 long-term care beds within five years and 30,000 beds over 10 years. In the coming weeks, additional policies to help you and your family will be unveiled as part of our Plan for the People of Ontario.